FeastHome – Years ago, people used kitchens as a mere utility. Nowadays, people have gone as far as decorating their kitchen with some of the finest decorations. It has turned from a place to cook to a place to wow over. As a result, designers and decorators are in a never-ending race to establish new ideas in trend. The trend keeps changing now and then, but they are all awesome. Want to know what is currently in trend and stay in competition? You are in the right place. 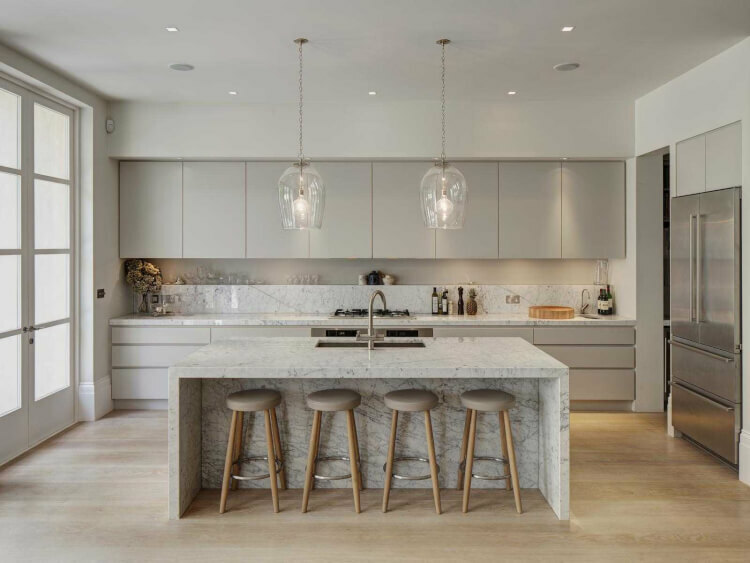 Read on to know about the newest kitchen decorations of 2019. 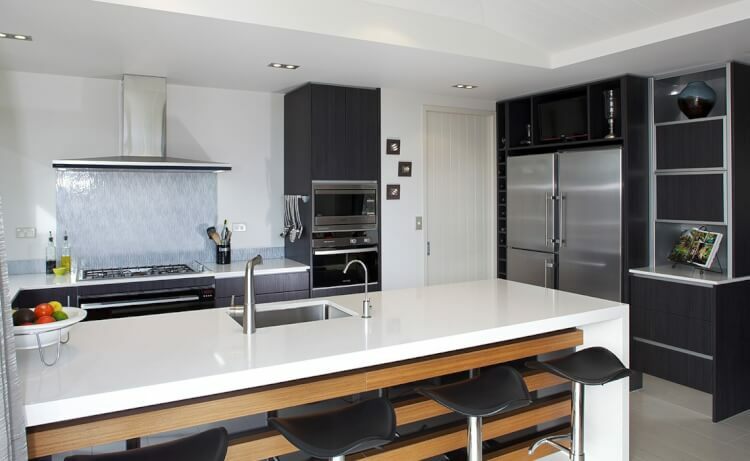 ‘Kitchen design in 2019 is all about timber veneers, colour contrast, texture, metallics and the on-going industrial look,’ says bespoke furniture manufacturers Schmidt. These have been in trend for some time, but decorators have found a way to keep this trend alive. Naturally, you add vibrant shades of colours to your shelves and walls. Some people have mastered it and have their own unique way of adding vibrancy to the kitchen. They use lighter shades for cooking areas and darker shades for other areas. Surprisingly, it works! Gold and brown: We have already expressed our love for gold and brown. These colours enrich the class of the kitchen entirely. To really nail the look, you can get gold coloured faucets, yellow hanging lamps, wooden shelves and brass cutlery. Your kitchen will stand out from the entire house. Let the island stand out: Most people opt for a entirely white kitchen. It’s a great design. But, did you know you can add a small pop of colour in it and make it look even better? Yes. A stationary island that doubles as storage and a station for food preparation can help you with that. Add a subtle shade of dull gree or pale red. Any shade in the dull colour palette works. Don’t add any flashy colour. It will mess up the elegant look you are trying to achieve on the rest of the kitchen. Add a faucet and invite your family members for an occasional help and chat. Small changes make big statements: Want a single coloured kitchen? Fine, it is a great look. Want to step it up? You can make a change as small as opting for brass handles and knobs, and change the whole look of the kitchen. Imagine an all flashy white kitchen with chrome red handles. It is a cherry on top, I’d say. Trough sinks: These are small slim sinks that are placed usually on the island. You can fill it up with ice and chill your champagne or place your greens as you wash them under a faucet. These nice temporary storages are statement-makers and add a little utility to the kitchen. Stone worktops: These are a good thing to bring life to the kitchen. They add some feel to the kitchen, and are great to work upon. Appliances are getting smarter: It is time you let machines work for you. Appliances have become so smart that they are able to order groceries, look out for expiring products in the refrigerator and even write your shopping list. They are great. Don’t be afraid to make mistakes. A lot of mistakes have turned out to be great trends. Start as small as changing the colour of the lamp. It will give you confidence to make changes and embrace them. Some people have mastered the usage to dark themes in the kitchen. You can too. The key is to not overdo it. 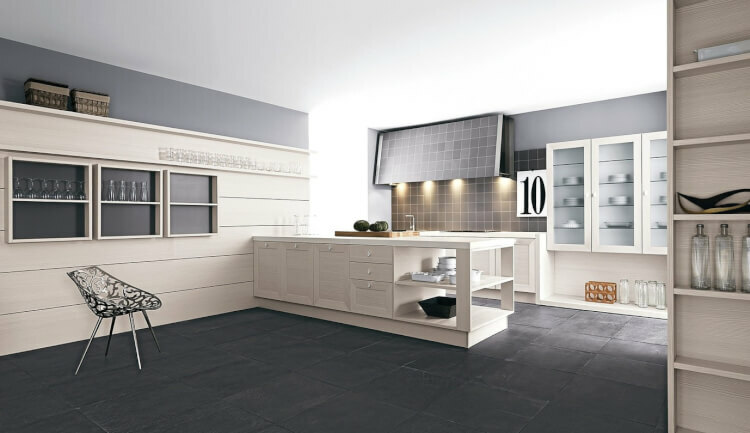 If you have wooden cabinets, use black stone for countertops and ivory white for the kitchen walls. This is a great example of doing it right. In-built wine coolers are great. You can invest in one. It adds to the usability. We have just seen all the ways to decorate your kitchen in 2019. 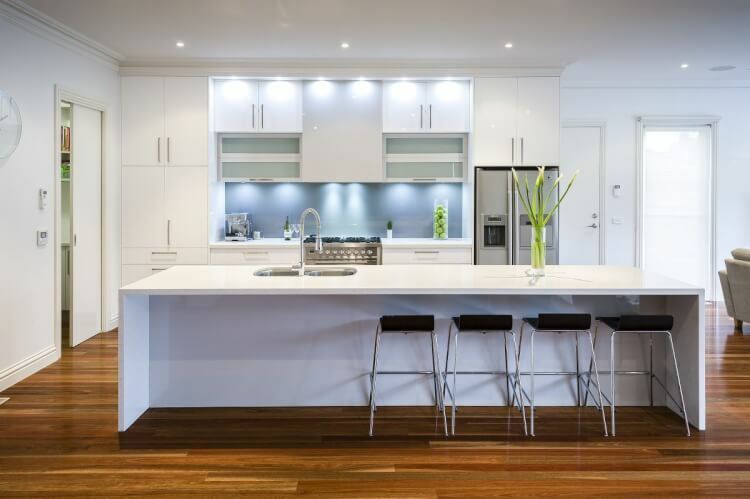 Some of the trends have been here for long, like all-white kitchens and vibrant colour themes. Some are fairly new, like hues of blue. Hues of blue are a great choice, and the darker shades are increasingly popular. It adds a fun atmosphere to the kitchen. It is a very bold move, but if you properly succeed in it, it will look awesome. Some people add a layer of white for the borders of the cabinets and counter tops. Some people add pale red shade for the inner shelves of their kitchen. This usually works for ivory coloured kitchens, but some people have fused it with so many other colours. Sketch the kitchen that you want for yourself. This will help you plan the style and eliminate any problems that might arise. Frames are another awesome way to decorate your kitchen. We love the idea and have seen some great models. There are so many types and you can mix and match and use them. Finally, the decoration reflects your inner beauty. Do not compromise on it. Try to incorporate all the designs you like as much as possible. Hope you have fun decorating your kitchen just like the ones currently in trend.